The other day, as we were sitting in front of the TV (don't judge, it was cold outside! ), I got a craving. Good ol' Chicken Casserole. 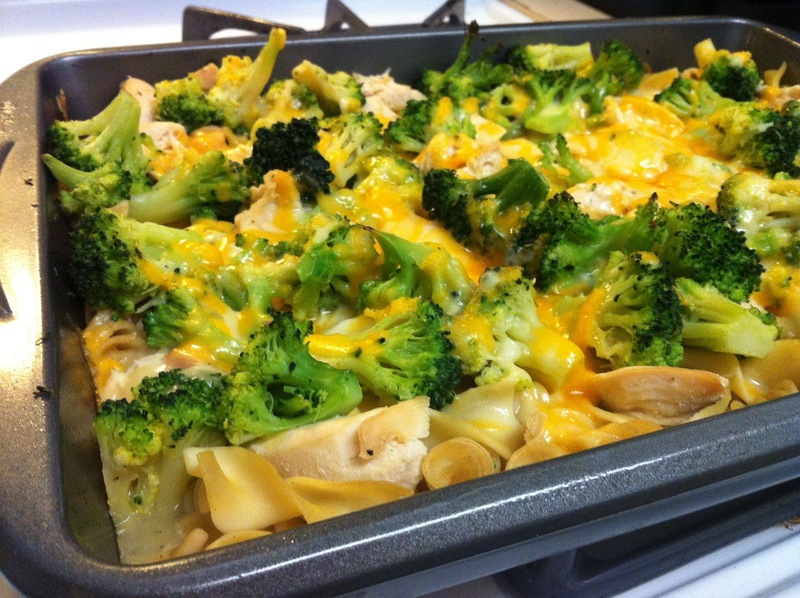 You know, the one with noodles, cheese and broccoli. I had some chicken breasts thawing anyway. I looked through my freezer and pantry, and thanked myself, once again, for being a food hoarder. Because I had everything I needed on hand to satisfy my craving. Love it when a last minute plan comes together! I thought I'd share this. It's a potluck favorite, and super easy! Boil a pot of water with a little bit of salt for your pasta. In a separate pot, boil your chicken breasts with a little bit of pepper. Microwave your bag of frozen broccoli. Open the bag, and let it cool somewhat. Pour the can of cream of chicken soup, plus one soup can of milk in a bowl, and wisk together. Grease the bottom of a 13x9 inch pan with canola oil spray or butter or whatever you usually grease your pans with. Pour in your cooked egg noodles. Pour soup/milk mixture over that. Top with chicken, and stir everything together.